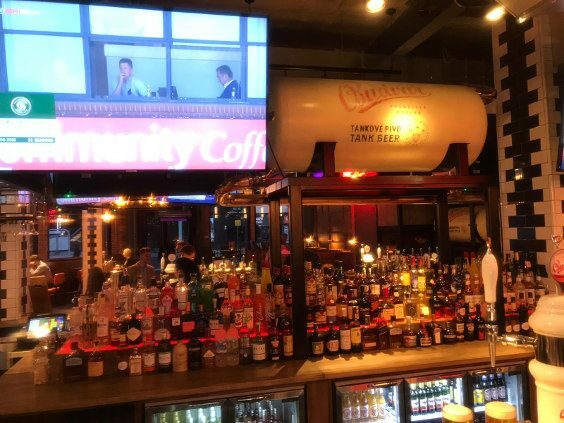 Leeds has got itself a new, game-changing entertainment venue, and if first impressions are anything to go by, The Box will be a welcome addition to the social scene. It’s the second venue of its kind, with the original Box bar a staple part of Headingley life, a few miles up the road. Now it’s hit the city-centre, it promises to deliver something exciting, experiential and new. Walking in to the venue, it’s a bright and open place, with seats aplenty and lots of standing space. It has a large bar, and a lot of smiley faces to welcome you. There’s a great buzz too. On our visit, a number of us made for a table and grabbed hold of a menu, which offers us some mouth-watering options. Pizzas, powerbowls and burgers, all with vegetarian offerings make up a decent food selection. Price wise, it’s great too. Feeling peckish, I liked the sound of the Box Nuggets, crispy fried chicken nuggets (£5.95), with Ranch Sauce dip. I also went with the delicious sounding Chicago Burger which comes with triple-cooked chips for £10.50. Whilst we waited for food, I enjoyed a pint of Budvar and a game of Shuffleboard. The quality of the beer was noticeably good, and I found out that The Box is the first place in Leeds to have a Budvar tank. This tank will take a weekly delivery of authentic Budvar beer direct from the Czech Republic. And the Shuffleboard is quite the competitive addiction too! Priced at £8 for half an hour, or £15 for 60 minutes, I’m sure it’s going to prove to be a surefire hit with groups of friends. It was with us, and despite coming away the loser I’ll be back to play this some more. Electronic darts is available too. The Box Nuggets arrive, and they’re good. Really good. You get plenty, and they’re succulent. Melt in the mouth chicken, with a crispy coating. They’re advertised with BBQ sauce, but I think the Ranch Sauce is a better complement to them. It keeps each bite of the dish light and fresh. And when the Chicago Burger came, it tasted as good as it looked. A double beef burger, with smoked pancetta, American cheese, onions, jalapenos, pickle and lettuce. It was a juicy and succulent eat. Made from high quality chuck and fore beef rib from Lishman’s butcher in Ilkley; I’d made the right choice. The accompanying fries were well cooked, but I found them a bit over-salted for my liking. And of course, the key to a great burger meal…the brioche bun. Big tick against the main course for me! Once I’d eaten every last bit, I’d noticed The Box had Pornstar Martini and Espresso Martini cocktails on tap. I had to give one a go, and plumped for the Espresso option. So did a few others in the group. I’ve really got in to this cocktail of late, so it intrigued me to see what the tap version might be like. And I really liked it. The head is a bit sweeter and stickier than a fresh pour, and that wasn’t to everyone’s taste, but it was fine for me. And when a bar is busy, and I want a cocktail, give me quick service over watching a show that creates an off-putting, four-deep crowd at the bar any time. With a number of large TV screens throughout the venue, I don’t think there’s a spot in the place where you can miss the televised sport. I’m sure it’ll prove to be a nice go-to spot for the football, but keep a classy offering at all times. DJ’s will be playing at weekends, and you can tell that The Box will carry an upbeat vibe and be a popular visit for those on a night out. I’ve had a great visit to The Box, and the quality of refreshment and food is superb. There’s much more on that menu that I want to try, and when a bar has this buzz on a weekday evening, I really need find out what it’s like on a Saturday night.